The results are in, and yes, you guessed it, the Chancellor failed to deliver an Autumn Statement that delivers for the poorest and tackles inequality. In fact, over all it looks like the rich will benefit from his set of announcements. How do I know he failed? Well, the Treasury’s own data shows he did, as did the Institute of Fiscal Studies’ analysis. 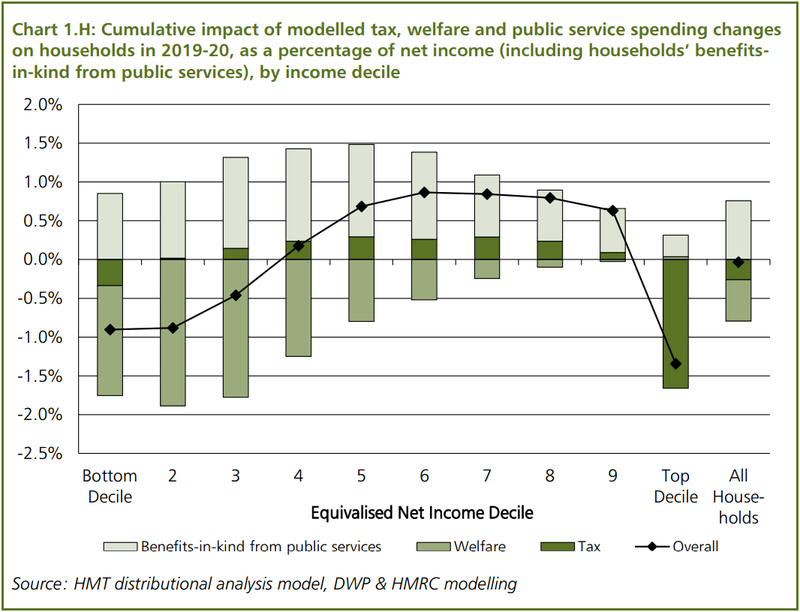 Figure 1, taken from the Treasury’s own distributional analysis, demonstrates that once you take the cumulative impact of tax, welfare and public service spending on households, the bottom three deciles see a reduction in the their incomes, while the fourth to ninth deciles see an increase. The top decile also loses, but if this were to be a budget addressing inequality, there would be a diagonal line slanted downwards, with the poor losing the least and then every other decile losing a bit more. In an ideal world, the poor would be gaining, rather than losing. 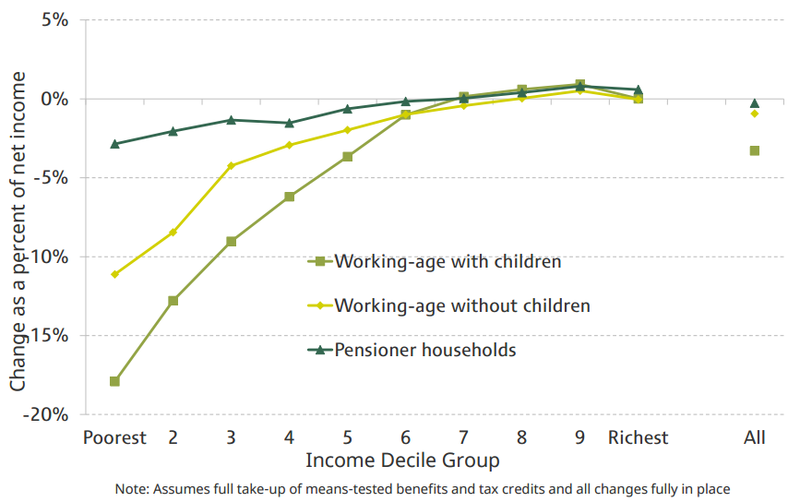 An even starker story can be seen using the IFS’s analysis which came out earlier today (Figure 2), which focuses only on the impact of tax and benefit reforms and helpfully breaks it down by household type. They find that those in the poorest deciles and with children will experience the biggest declines in their household incomes. Expect child poverty to increase. And it gets worse. 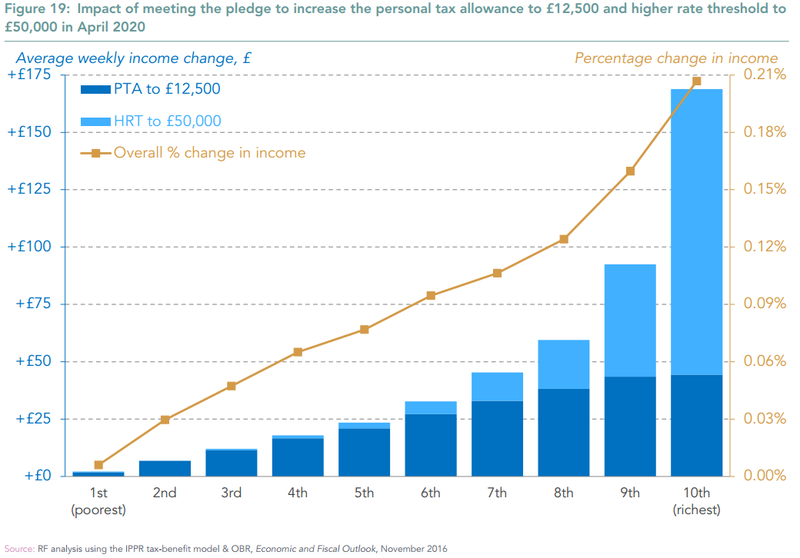 Drilling down into the pledge both to increase the personal allowance to £12,500 and increase the higher rate threshold of tax to £50k, Figure 3 shows just who will be winning the most. What a surprise: the rich. This is not the first time that a Budget or Autumn Statement has hurt the poorest the most. The Treasury’s distributional analysis has consistently deemed Osborne’s policies regressive. If it sounds like I’m angry, I am. I asked a friend who works in the Treasury about the distributional analysis and he told me that it is often done at the last minute, and has no bearing on policy decisions. If this is the case, then what’s the point of doing the analysis at all? "The government I lead will be driven, not by the interests of the privileged few, but by yours. We will do everything we can to give you more control over your lives. When we pass new laws, we’ll listen not to the mighty, but to you. 1. Tackling inequality means closing the gap between the rich and poor. 2. Do the distributional analysis on the proposed set of policy changes and then adapt policies so that they are progressive. 3. Any problems, give me call. Work areas: Economy and Industry, Inequality. Tags: economic alternative, equality, fair economy, inequality, politics.